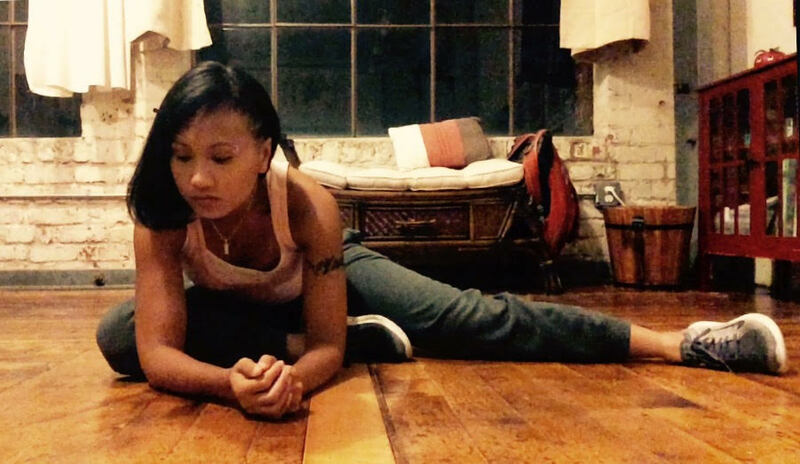 Image Description: A photo of Grace, sitting on the floor, stretching to her right. GRACE KONG, one of APIENC’s wonderful volunteers, identifies as a lesbian feminist and as an Excel geek. Grace currently works at the San Francisco International Airport, using her skills to work in data and financial analysis. Grace has been involved with community work for many years. Previously, she has worked with nonprofits and government agencies: with young adults who had dropped out of school, as well as in grant writing. Grace notes, “I’ve always been drawn to community activism,” and says that this is in part due to how she grew up, as a Cambodian refugee. Grace says, “Most of my organizing has been in the Seattle area,” where she lived before moving to the Bay Area. There, she was involved with a variety of groups and social justice issues: a grassroots organization called Khmer in Action, anti-deportation work, and “a lot of work with youth.” In the Bay Area, Grace is involved with APIQWTC, as well as local homeless shelters. As a volunteer with APIENC over the years, Grace has attended many events and supported by donating to the organization. One of Grace’s favorite memories is when APIENC hosted Spoken Word nights. “I felt like it was a radical and fun community space where folks were able to be creative,” she says, and appreciated the chance to meet new people and enjoy each other’s company. Most recently, Grace has been volunteering as APIENC’s trainer. She facilitates training runs three times a week so that Team APIENC can prepare themselves for the Berkeley Run Fundraiser later this month. “I really enjoy running,” Grace says, “so this was a natural way for me to help.” We are so grateful for all of Grace’s work! Fun fact: Grace is an animal whisperer. She feels very connected to other living beings, especially furry ones, and currently cares for two bunnies, one cat, and four fish. This entry was posted in frontpage, Volunteer Spotlight by sammie. Bookmark the permalink.